“Recon-ng is commonly seen as being most useful in the role of supporting Social Engineering engagements, but the real power of the framework lies in its ability to perform all steps of the traditional penetration testing methodology, except exploitation, within the context of reconnaissance. What does that mean? It means that we can do scope validation through host discovery, server enumeration, vulnerability discovery, and gain access to authentication credentials, all without sending a single packet to the target application or network. Recon-ng does this by leveraging powerful, 3rd party, web-based resources that do all of this stuff for us, and provide access to the results. 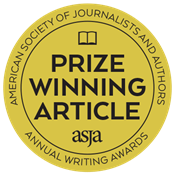 It is important to keep in mind that there are caveats to this. Using 3rd parties to collect data on clients may be in direct violation of Non-Disclosure Agreements (NDA) or contracts. It is up to the tester to make sure that the client specifically approves this activity as part of the testing agreement. While the framework is named for its focus on reconnaissance, the intent is not to limit its functionality to only recon. Python developers have been waiting a long time for a fun, easy, and useful project to contribute to. They now have that in Recon-ng. 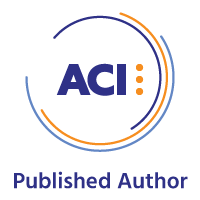 Therefore, when contributors come up with new ideas for modules that cross the boundary of reconnaissance into active discovery and exploitation, they are encouraged to submit them for review. The several discovery modules included in the framework are good examples of this. 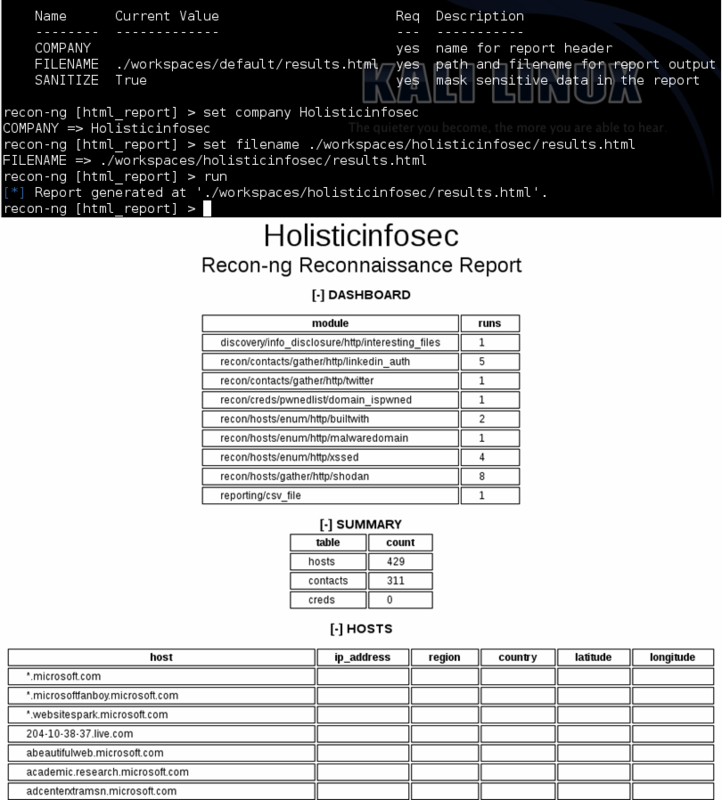 We’ll also use reconnaissance methods to lend to section 4.4.2 Testing for User Enumeration and Guessable User Account (OWASP-AT-002) from 4.4 Authentication Testing. We’ll use Recon-ng to realize the goals of a few of these OWASP Testing Guide steps as we explore further below. Figure 1 represents the initiated Recon-ng shell and its 57 recon, 6 discovery, 1 exploitation, and 2 reporting modules. The dependencies on dnspython, httplib2, and python-oauth2 are already met in the recon-ng lib directory. 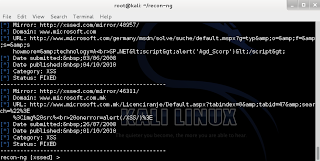 If you’re familiar with Metasploit you’ll be right at home with Recon-ng. Refer to the wiki for a usage overview. I worked with both the stable version 1.20, as well as the beta of 1.30, which should be a stable release by the time you read this. 1.30 includes major updates including what @LaNMaSteR53 Tweeted is a badly needed API key handling system.
. With a particular module loaded, use info for name, author, description, and options details. Then use set based on the options defined followed by the run command. That’s all there is to it. You can define individual workspaces or other global options as well. I ran show options then set workspace holisticinfosec for our efforts here. You can also set proxy settings here if you wish to record your sessions with the like of Burp Suite. The resulting report from Burp is a nice output product for your pentest engagements. Equally useful might be the use of an anonymizing proxy. Use the recon/hosts/enum/http/api/builtwith module for 4.2.1 Testing for Web Server Fingerprint (OWASP-IG-004). As the guidance states “knowing the version and type of a running web server allows testers to determine known vulnerabilities and the appropriate exploits to use during testing” you can imagine why. I loaded the module, passed set host holisticinfosec.org, and followed with run, resulting in Figure 2. For 4.2.2 Review Webserver Metafiles (OWASP-IG-001) an ideal module is discovery/info_disclosure/http/interesting_files. This is not a passive module; it will reach out and touch the defined source, and download discovered files such as robots.txt, sitemap.xml, crossdomain.xml, and phpinfo.php. The discovered and downloaded files are written to the workspace directory in which you are operating. The /recon-ng/workspace/default workspace is the default if none is specified in the global options. The xssed module relates nicely to section 4.2.5 Identify application entry points (OWASP-IG-003) which describes the process to identify application entry points. OWASP’s brief overview of this phase states that “enumerating the application and its attack surface is a key precursor before any attack should commence. This section will help you identify and map out every area within the application that should be investigated once your enumeration and mapping phase has been completed.” Parameters vulnerable to cross-site scripting (XSS) via GET or POST requests certainly fall in the “worthy of investigation” category as variables exhibiting XSS vulnerabilities are sometime vulnerable to other issues such as SQL injection or directory traversal. Of course, XSS in and of itself represents a number of opportunities for the attacker and should be paid close attention as such. The xssed module as written by Micah Hoffman (@WebBreacher) checks XSSed.com for XSS records for the given domain and displays the first 20 results. 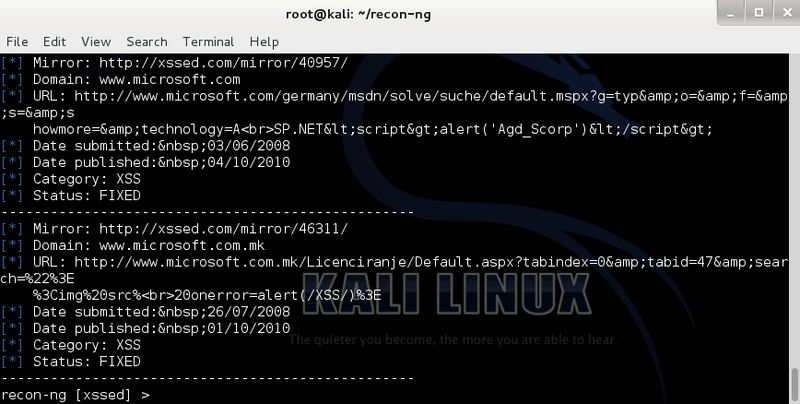 From the Recon-ng prompt I passed the use xssed command followed by set domain microsoft.com. Given that I work there and my attack & penetration testing may have a Microsoft domain in scope for a penetration test, this module could prove a logical first step. Note that all the returned results for this effort have been fixed even if results state otherwise. After setting the domain parameter one need only issue a run command to kick off the module. Figure 3 shows the results. The result advises us that, had it not been fixed, the search parameter would have been ideal for further exploration or use in packaging XSS payloads during an exploitation phase. Recon-ng’s LinkedIn Authenticated Contact Enumerator is a great way to gather possible social engineering or bruteforcing targets, ideal during the 4.4.2 Testing for User Enumeration and Guessable User Account (OWASP-AT-002) phase. You’ll need a LinkedIn API key; just login with you LinkedIn cred and visit the LinkedIn Developer Network. Note: a few Recon-ng modules require API keys. Keep in mind that the Pwnedlist API has a rather high cost associated with it, but if your organization has already purchased API access, you can leverage it with Recon-ng for the Pwnedlist modules account_creds, api_usage, domain_creds, domain_ispwned, leak_lookup, and leaks_dump. Tim pointed out that, as a Pwnedlist customer, he extremely fond of the domain_creds module in particular as it returns actual domain credentials. Nothing like walking in to a customer penetration testing engagement already in possession of domain creds. For the LinkedIn module run use linkedin, followed by set company , then run. No screenshot here as the module dumps lots of juicy contact data and I don’t want a bunch of folks upset with me. Keep in mind that you can always query the native Recon-ng SQLite database with the query command followed by common SQL syntax. As an example query select * from hosts returns data populated in the columns host, ip_address, region, country, latitude, and longitude during module runs. The database schema is included in Figure 4. Finally, you will definitely want to take advantage of the reporting modules. Tim mentioned that the reporting/csv_file module is great for importing into Excel then massaging the data while reporting/html_report module is optimal for producing reports for customers. Figure 5 shows my reporting run against all date I’d written so for the db. There are, as is often the case with great toolsmith topics, too many features and killer use case scenarios to cover here. I even suggested to Tim he write the Recon-ng book. Yes, I think it’s that good. I’m really excited about Recon-ng and wish Tim great success. My two favorite phases are reconnaissance and exploitation and Recon-ng fits the bill to dominate the first and contribute greatly to the second. Setting it up and getting started is a sixty second proposition and leaves you no room for excuses. Get cracking with this tool STAT, run it against entities specific to your organizations, and immediately benefit. Or there’s always the alternative of waiting and having the hackers do it for you.